This blog occasionally uses foul language as well as logic and reason. Damping-off is a common disease that can occur in both germinating seeds and young seedlings. The disease is caused by any of a number of pathogens that can also attack cuttings. The problem often occurs before seeds are able to germinate but it can also develop after germination and attack the emergent seedling. If it happens before your seeds germinate, you'll know because nothing will come out. In seedlings, it starts with dark rot on the stem near the soil surface and as it progresses, the seedling falls over and dies. If the pathogen is below the soil surface, the rot may start from the tip of the roots and progress up the seedling until the stem rots and then the seedling falls over and dies. Seedlings that survive until they are a bit older before they are infected may develop what horticulturists call "wire-stem". The base of the stem is partially invaded by the fungus which becomes shriveled and constricted at or just below the soil line. The plant may live a short unpleasant life before it falls over and dies. You should do an image search online to see what damping off looks like. The following is a list of preventative measures developed by the University of Connecticut Integrated Pest Management Program. The best way to control this disease is to prevent it. There are many prevention techniques, and a combination of them is most effective. One way to help prevent this disease is to keep the fungi that cause it out of the flats of seeds. Plant seeds and root cuttings only in sterilized seedling mix or other planting media, using only sterilized containers. Use only clean non-recycled water on the seeds. Place seed trays on clean, sterilized benches. Do not allow soiled hands and tools to come into contact with the sterile media. Reintroduction of the fungi can cause fast disease progression because other fungi which normally compete with these fungi are absent from sterile mixes. Remove any trays with damping-off immediately. A second way to help prevent this disease is to encourage the seeds to germinate and grow as fast as possible. Plants are only susceptible to damping-off as seedlings. 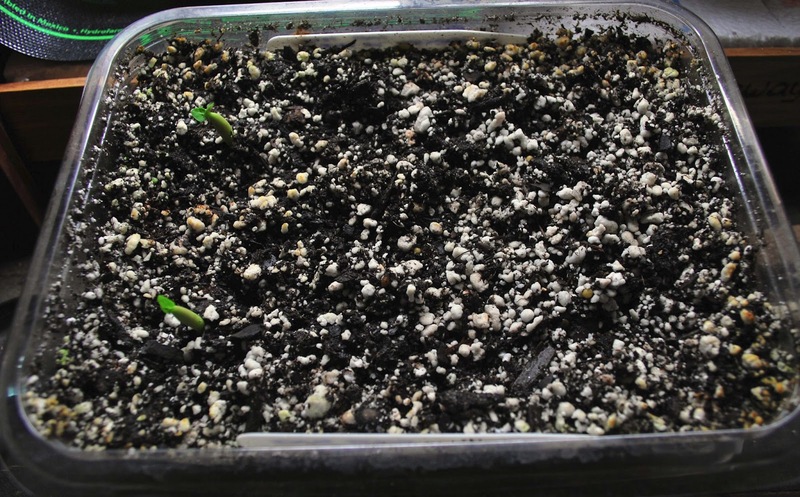 Use adequate light and heat to germinate and grow seedlings quickly. Bottom heat may speed germination. Avoid planting seeds too deeply. A third way to help prevent this disease from causing huge losses (although some loss may occur) is to keep conditions in the seeding trays less favorable to the fungi. These fungi like wet conditions. Sow seeds thinly to allow air to circulate between seedlings. Chamomile: Naturally high in sulphur, this popular tea is a fungicide. Make an infusion with three chamomile teabags and allow it to steep for about 20 minutes. Add the concentration to a sterilized spray bottle and mist the seedlings once they start to sprout. Ceylon cinnamon: A natural anti-fungal, sprinkling the soil surface with some ground cinnamon can stop damping off. This needs to be done only once. You want your soil moist but not wet, you want high heat and humidity but you also want air circulation. This is the gardening equivalent of wire-walking. It's a bit dumb to aim for failure but when it does happen, it's always the more entertaining part of oxygen consumption. My second seed-sowing project, for instance, started out with two astounding seeds that pushed out--get this--20 hours after sowing. Super seeds! Two days passed and no sprouts. After another two days, the entire salad box was covered with a green mat of fungal fiesta that quite frankly looked attractive, if only I didn't have vested interest in the stuff underneath that they were using as energy bars. Apparently, I forgot to cut out holes on the lid to ensure air circulation. Carefully avoiding the new sprouts, the salad box was sprinkled liberally with ceylon cinnamon, a trick I picked up from that Amazon thread. I really should have done this at the outset to prevent the problem from occurring in the first place. But I do not care for the stench of cinnamon. Once applied, however, the foul substance killed off the fungal growth. Or maybe, since it is a fine power, it just covered it up. I gave the crib a couple of days while the two layers dueled, wondering if the remaining seeds would sprout. Unfortunately, the following day was a weekend--never a good time for patience. The two seedlings were dug out of the mess and replanted in individual pots with fresh soil. Then I dug out the rest of the seeds--three had completely disappeared, leaving nothing but husk; five appeared to have some remaining heft that felt like they could still germinate. Out of curiosity, I squished one of the seeds and brown stuff came squirting out of one end like toothpaste. Two more exited the same way, only they were kind of white. Maybe that was undifferentiated plant matter on their way to becoming plants and were needlessly murdered. I decided to leave the last one alone and plopped it on an empty pot. It sprouted a week later, which was a surprise. All three rescued seeds are doing well. Given these results (3 plants out of 10 seeds), I sowed for the third and last time. With air holes on the lid this time, I got 8 plants out of 10 seeds. Unlike my first batch, these seeds took over 20 days to come out, probably largely due more to the quality and age of the seeds rather than the conditions of germination. Shoot, I was hoping you had a link to the Amazon thread in the Further Reading section. Seriously? But there are better sources online. Although, if you want to search, all my heating mats are from Hydrofarm so it's probably in one of those product reviews or the Q&As. © 2013 Kalachuchi Atbp All Rights Reserved.. Picture Window theme. Powered by Blogger.